OneNote is such a fantastic application, never understood why it lacked any power when it came to tables and calculations. While you could do some basic math in a table cell, there was no such thing as a cell reference when copying a formula, and formatting a cell, or group of cells was just problematic. Well, here comes OneNote 2013 and we now have a solution! 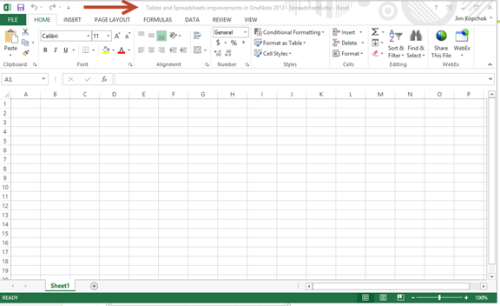 A full bred representation of a Microsoft Excel spreadsheet right within our OneNote notebook. And even tables get some polishing. So let’s see first what we can do with a table. 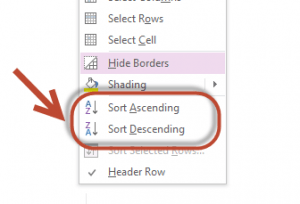 Unlike earlier versions of OneNote, you can now sort columns and format cells. You can create or import a live Excel spreadsheet. This means the full set of Excel features is now available to you within OneNote. When you create or import a spreadsheet in OneNote, the file is physically stored within the OneNote notebook. If you like, you can export or save the spreadsheet to another location. 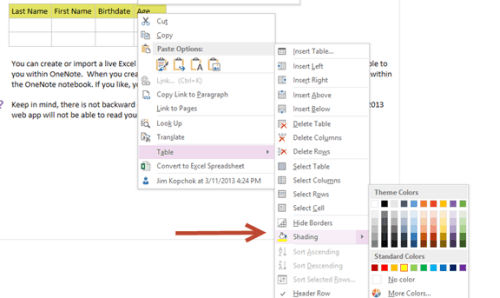 Creating a new spreadsheet within OneNote 2013 allows you to see a live version in OneNote and then activate a session within Excel to continue editing and using its powerful features. The spreadsheet file is maintained within OneNote 2013 unless you choose to save or export it to another location. Exporting, in this case, means converting the spreadsheet to a PDF. 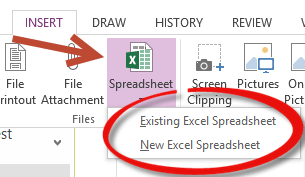 This is similar to inserting a file into earlier versions of OneNote, with the exception that you now see a live version of the contents of the spreadsheet. Look what happens when you have two sheets in your Excel workbook! 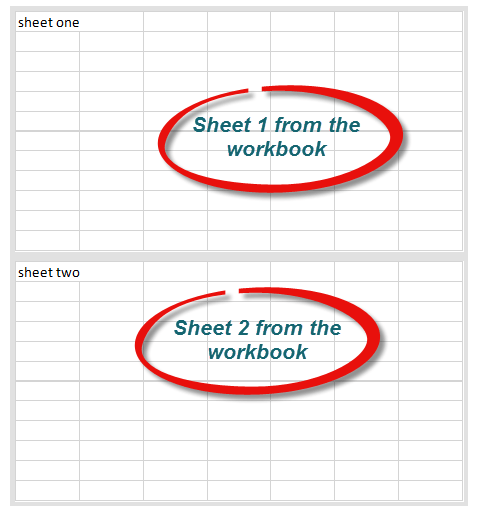 You can click on either sheet to begin editing within Excel. 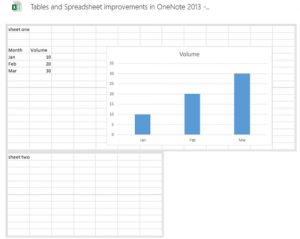 Finally, here is an example of a spreadsheet within OneNote 2013 that has an embedded chart! IDEA! How about putting OneNote in a SharePoint Library with alerts set to changes in the file. How’s that for a dynamic update? More good news for OneNote 2010 users too! Even though you can’t create a new spreadsheet within the application, you can see the spreadsheet and edit it within the OneNote 2010 app. That’s it for now, but we hope you enjoy using the new table and spreadsheet features within OneNote 2013. For more Microsoft training information visit www.directionstraining.com or call 1-855-575-8900.